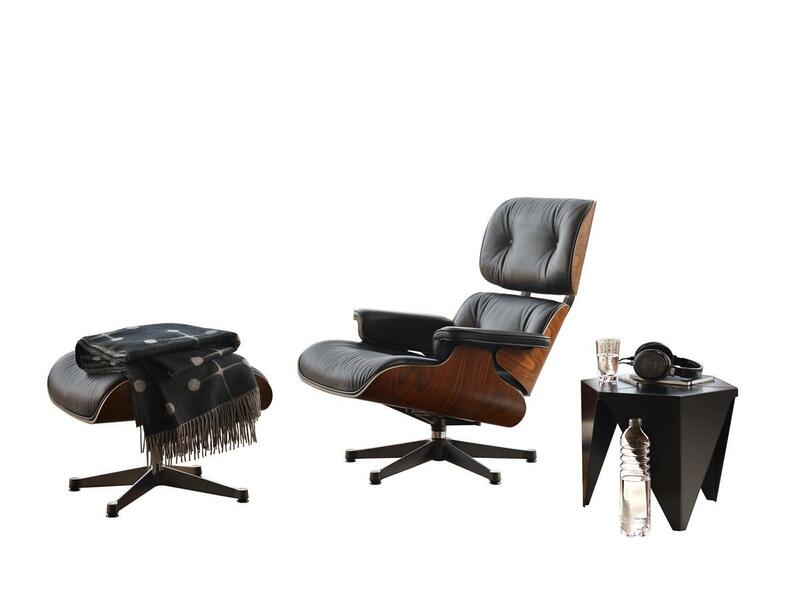 As part of the Vitra Black Collection the Eames Lounge Chair & Ottoman Black is a special edition of the Eames design classic. 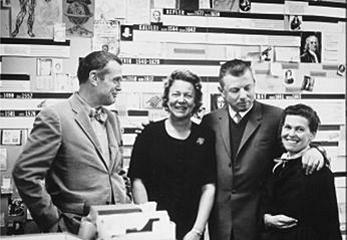 According to the popular legend, Ray & Charles Eames created their design in 1956 in response to a request from Billy Wilder for a modern, and comfortable, lounge chair. Vitra has produced the luxurious Eames Lounge Chair since then in a series of different versions, the Black Edition relying entirely on one hue: black lacquered ash veneer, a deep black leather and black powder-coated base. Care Leather: Superficial dirt can be removed with a damp cloth, in such cases always avoid vigorous rubbing. For cleaning we recommend special leather cleaner in foam or liquid form. Small stains are best removed with a colourless eraser. To protect the leather from drying out, you should make use of an appropriate leather conditioner. Liquid sills should be immediately dabbed dry with a cloth and, if necessary, wiped with a little water. Veneer: wipe with a soft, slightly damp cloth and a mild detergent. Wet surfaces should be dried immediately with a cloth. With the Lounge Chair & Ottoman Black Vitra launched in 2013 a black version of the classic Eames Lounge Chair, which was originally developed in the 1950s by Charles and Ray Eames. Designed as "a contemporary version of the classic English club chair" the luxurious Eames lounge chair quickly established itself as a classic in its own right. With its new interpretation of the genre the two designers set completely new standards: the Vitra Eames Lounge Chair was not only much lighter and more elegant than its predecessor, but combined these qualities with high degree of comfort and exceptionally high quality materials. The Vitra Eames Lounge Chair and Ottoman are based on the same design principle: plywood shells support leather cushions which serve as a seat, backrest and armrest. The seats are mounted on a rotating five foot base, the Ottoman on a cross-shaped steel foot. The multi-award winning Eames Lounge Chair has been produce by Vitra since 1956, is now one of Charles and Ray Eames' most distinctive and popular works. As a milestone in the history of modern design the Lounge Chair is an integral part of the design collection of the MoMA and other important design institutions worldwide. Noble in black. The Vitra Lounge Chair Black is composed entirely of black elements. 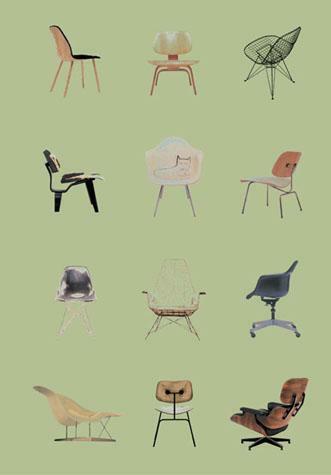 Charles and Ray Eames are among the most important designers of 20th century. Having married in the early 1940s the pair established their design studio in Los Angeles and in the ensuing three decades of creative cooperation the pair developed an extensive body of work, which included not only trendsetting furniture designs but also for example, toys, textiles, architectural designs, films, photography and exhibition designs. The Eames studio remained active until the death of Charles Eames' in 1978. Following his death the studio closed. Ray Eames died 10 years to the day after her husband on on 21 August 1988. 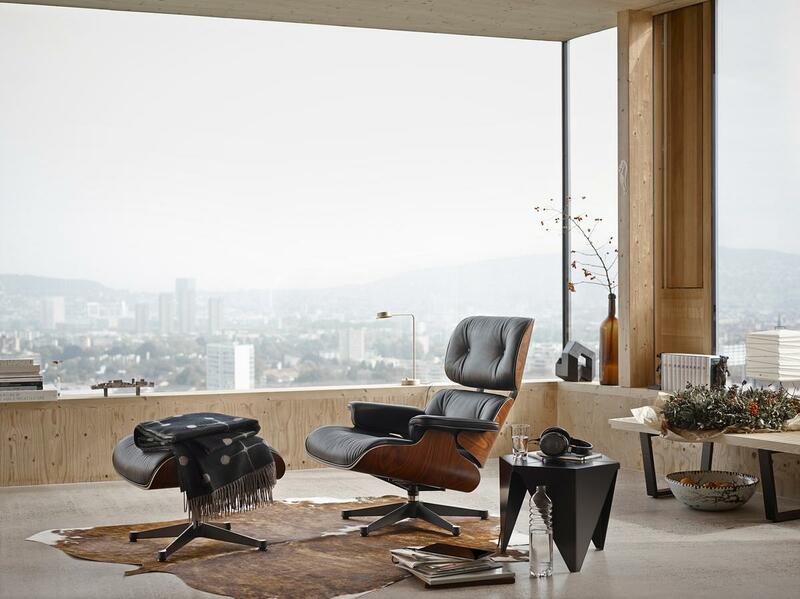 The manufacturer of the Eames Lounge Chair, Vitra is closely linked with the name Eames. Willi Fehlbaum, who founded Vitra in the early 1950s Vitra, discovered Eames furniture while in New York with his wife Erika, and both were so excited that they promptly set about securing European production from the chairs' American manufacturers Herman Miller. In the late 1950s Vitra finally began production of Eames designs and since this time have been the only authorised manufacturer of Eames furniture in Europe and Asia. In addition to the Eames' furniture and accessories Vitra also produces modern classics from designers like Alexander Girard, George Nelson or Verner Panton, in addition to contemporary designs from designers such as Jasper Morrison or Ronan and Erwan Bouroullec. 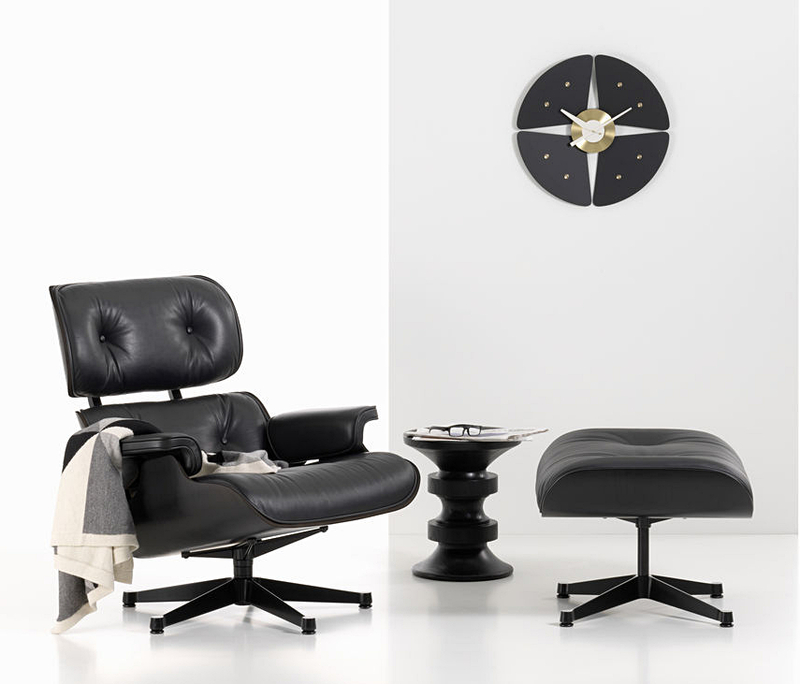 The Eames Lounge Chair Black created in 2013 as part of the Vitra Black Collection. The seat and backrest of Vitra's Lounge Chair are made of laminated plywood shells which are fitted with leather upholstery; in total there are three shells - seat, backrest and headrest. The rotatable five foot base of the Eames Lounge Chair Black is, as with that of the Ottoman, is made from smooth black powder coated die-cast aluminium . 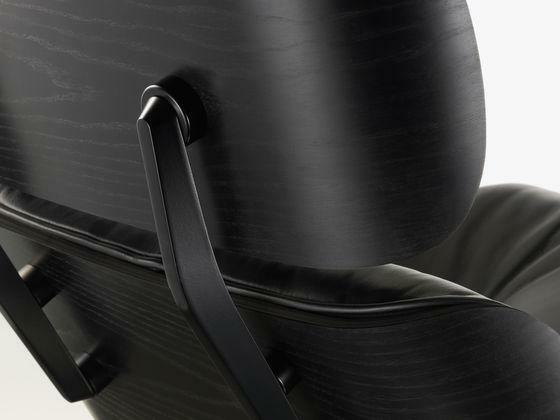 With the Vitra Edition Black the veneer of the plywood shells is only available in black lacquered ash, similarly the premium leather is in deep black. On production for over 50 years the construction of each and every Eames Lounge Chair is still based on the same 47 steps it always was. 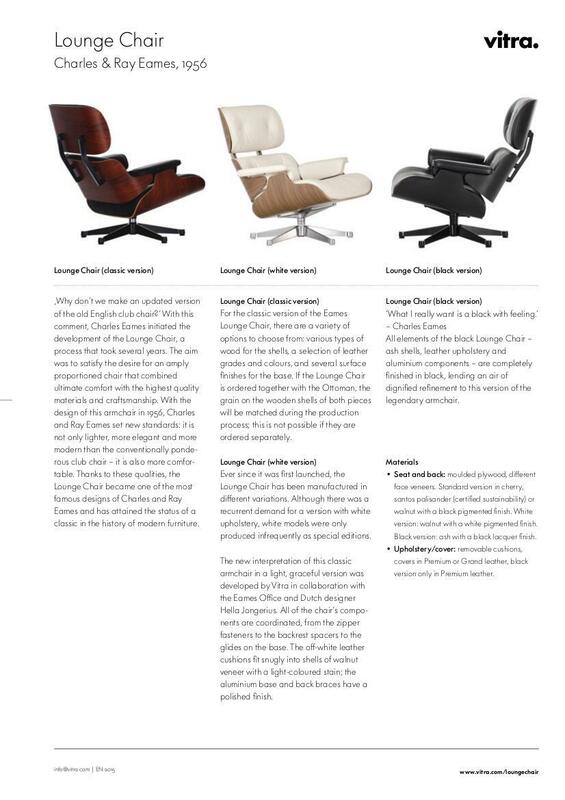 what has changed is that the Vitra Eames Lounge Chair is now offered today in two different heights, the original height of 84 cm and a new 89 cm version adjusted in response to the increased average height of humans now compared to then. All veneers are sourced exclusively from sustainably managed forests, in addition each Lounge Chair is composed of 24 percent recycled materials and can be recycled to 29 per cent. With a design classics such as the Vitra Lounge Chair, which can be passed to the next generation, the latter fact is of course not too relevant. The Vitra Eames Lounge Chair was created in 1957. To accompany the economic boom of the 50s, and the corresponding increasing importance of consumption, the very luxurious Eames Lounge Chair will be seen as a typical style of its time. Charles and Ray Eames began with the creation of with affordable series produced furniture, such as the Eames Plastic Chairs; however, in response to the rising consumption they created the Lounge Chair as a design for the high-price segment. In addition, the Eames Lounge Chair with its large, inviting seating area corresponded to a new fashion: the living room as a retreat. Formally the Vitra Eames Lounge Chair reflects the simple, often organic forms of modernity, the increasingly popularity and success of Scandinavian design or works created in Germany under the name of good form.